In 1782 the Bald Eagle was selected as the National Bird of the United States. At that time this raptor was very common throughout America. But things changed. During the 1960 the population of Bald Eagles in the US had dropped to approximately 450 nesting pairs. At one point in Alaska they offered 50 cents as a bounty for each American Eagle and this resulted in the deaths of around 150,000 eagles. Bald Eagles went from endangered to threatened status in 1995, and were delisted altogether in 2007. But even today eagles are still covered by the Bald and Golden Eagle Protection Act. These birds are still quite fragile so be respectful and turn in anyone you see who is hunting them. It is currently against the law to hunt eagles or even to possess their feathers, unless you are a registered Native American. The Native Americans are exempted from the feathers restriction because they use the feathers in their religious ceremonies. Eagles build nests called aeries in tree tops. Many times the eagles will return to the same nest the each following year and will add on to the nest with more sticks. One eagles nest in Florida eventually reached 4,000 lbs and was 20 feet high and 9 feet wide. Where you can see them today. This is a bird of beauty, strength and grace. It is a symbol of divine light and earthly power. The eagle is revered by the Greeks, Romans, Babylonians, Persians and Greeks. One of the places where eagles have been rehabilitated and restored to their former glory in the US is the Gabbert Raptor Center at the University of Minnesota. If you get a chance try to visit it or volunteer to work with these majestic birds. The James River Bald Eagle Rescue has the largest Bald Eagle roost east of the Mississippi River. Check with the Nature Conservancy to see if there is an eagle conservancy in your own state. 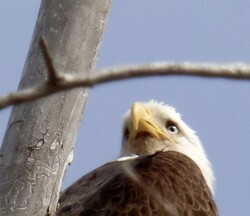 Currently there seem to be either 3 or 4 bald eagle pairs nesting at Cherry Creek State Park which is near my home. That’s where I took this photo. Click the blue underlined text to purchase it. An Eagle Named Freedom was written by Jeff Guidry. It is a moving account of an eagle who was injured and was taken to the Sarvey Wildlife Care Center for rehabilitation of his broken wing. Jeff was a volunteer at the Center and this story is an account of being diagnosed with non-Hotchins Lymphoma and how much help Freedom was psychologically. Many Americans have never seen a Bald Eagle in the wild - even though they can be found in every state except Hawaii. Sometimes people will see them as a zoo. I happened to be in the right place at the right time to get the above photograph myself. Some of the places visited often that have a large population of eagles are: Maine, Alaska and the Florida Everglades. Four great areas in Alaska include: Cordova, Wrangell, the Kenai Peninsula, and The Chilkat Bald Eagle Preserve (just North of Haines) best time to come is November or December. In Florida three good sites for eagles are St. Mark’s National Wildlife Refuge, Three Lakes Wildlife Management area, and Merritt Island National Wildlife Refuge. Also Washington, Oregon, Colorado, Kentucky or Tennessee, Nebraska Minnesota and Missouri near Branson. Always check along the open waters of rivers and lakes and in winter near ice fishermen. The main meal of eagles is fish, but they will eat other birds and mammals. Florida has more nesting Bald Eagles that any other state. 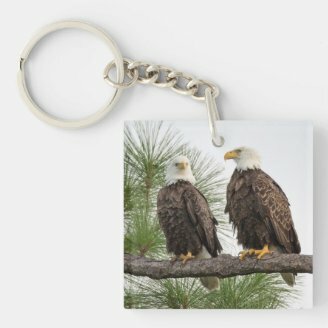 The behavior most often seen when Bald Eagles are courting is that they will fly towards each other and then roll over and present it's talons. Once they have mated they tend to stay together for as long as they both live. Don't Mess with the Eagle Use Caution! Did you know that it usually takes a young bald eagle around 5 years to grow his distinctive white head feathers? This one is an adult. Both males and females have the same feather markings. Do you know about digiscoping? These days a lot of birders use a scope to bring the bird closer so you can view it well. Now they have developed special attachments for your smartphone that swing it in front of your scope really close and this is called digiscoping. The photo's come out very nice, but the number of pixels isn't professional grade. I actually used an SLR camera. Usually people use some kind of tripod to keep their camera steady and to avoid any shake. Four Bald Eagles in One Tree on the Rocky Mountain Arsenal - I saw SEVEN bald eagles on this day! Have You Ever Seen or Photographed an American Eagle? MBC, Every time I see bald eagles I think of Benjamin Franklin's preferences for wild turkeys as avian symbols of the USA! Just yesterday when I was out wildlife mapping, I saw two bald eagles perched in the top thirds of sycamore trees and then two wild turkeys foraging in a nature area nearby. Isn't it interesting the number of raptors and songbirds that look at a nest as something to come back to and enlarge, or not? As always your photos are stunning. I know that eagles repair and reuse their nests, but 20 feet by 9 feet and 4,000 pounds!! Wow! Great Horned Owls also reuse their nests, I've been watching a nest that's been there for 3 years that I know of. Thanks for a lovely article.